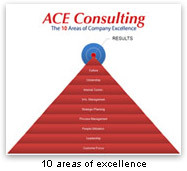 The ACE acronym stands for Accelerating Company Excellence and is a structured method for bringing about internal changes within emerging and mature growth organizations to position them for long-term quality growth and profitability. If the ten areas of excellence are effectively coordinated and made reproducible, the foundation for long-term, great organizational performance will be in place. If these internal changes are not made, the organization will be doomed to mediocrity or failure. 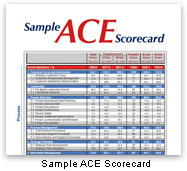 One of the critical areas that dictate the rate of acceleration is Leadership, which is why we developed a prescriptive process to equip Leaders called ICE Leadership. U.S. 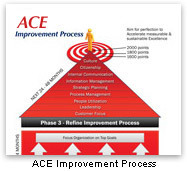 Leadership becomes a strategic partner with their clients to implement the ACE Improvement Process over a 36 to 60 month time span, depending upon both the current size of the organization and the current rate at which the organization is growing.